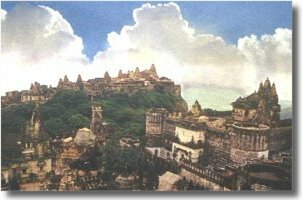 Bhavnagar Tourism of Gujarat State, Jain Temples Tour of Palitana, Gujarat TourismCircuit. An 18th century coastal city, Bhavnagar was the capital of an erstwhile princely state. Bhavnagar was founded by Bhavsinhji Gohil, the rulers of Sihor in 1723 AD. It is an intermediate port with a natural harbour. To overcome the difficulty of situation and to ensure the floatation of ships even with receding tides a lockgate has been constructed at the concrete jetty. For the tourist it is a convenient base for visits to the town of Palitana and the sacred hill of Shatrunjaya.It is a premier cotton-exporting seaport on the south-eastern Saurashtra coast. Today Bhavnagar is a city buzzing with people, students, marketplaces, educational institutions, and industries. It is a beautiful blend of modernism and traditionalism. People of this city are simple, easygoing and downright modest. The entire atmosphere is that of peace and comfort. It is known for its hospitality and generosity. The city has associations with Mahatma Gandhi, who went to university here, and relics of his life can be seen at Gandhi smriti in the 1895 AD Barton museum building, which also has a fine collection of coins, stamps, guns and other arms, sculpture and folk arts. Bhavnagar has myriad relics of it�s princely rule-the Maharajahs commissioned architects like Sir William Emerson, the architect of the Victoria. Bhavnagar offer various sightseeing options including Gandhi Smriti which is a sort of complex attached to a clock tower in the heart of the city. Also visit Gopnath; vying for eminence on the tourist circuit with development of a heritage hotel. Also visit Takhteshwar Temple, the holy temple of Lord Shiva named in the memory of Maharaja Takhtasinhji is a very popular place. Also visit Old books, manuscripts, rare coins, arms and armor used by the rulers of Bhavnagar are on display at the Barton Library and Museum. In excursions visit Shatrunjaya hills, in the eastern part of the Saurashtra there is a Muslim shrine on the hilltop. Also visit Vijay Vilas Palace, once the country retreat, of the Gohil Rajputs offers a splendid view of the Shatrunjaya Hill and the historic Palitana temples. It is a living monument to Gandhiji. It was opened in 1955.This is a sort of complex attached to a clock tower in the heart of the city. The tower bells with music and timings on all four sides. The smriti has a Gandhi picture gallery with photos on the Life of Mahatma Gandhi from birth to death, a small museum of ancient things, a big departmental Khadi Gramodyog Bhandar and a first class, well established and a well arranged running library. A beautiful hemlet on the coast of the Gulf of Khambhatand at a distance of 10 kms from Talaja, the taluka headquarter of Bhavnagar district is Gopnath; vying for eminence on the tourist circuit with development of a heritage hotel - Gopnath Bungalow - the pleasant sea-shore retreat of Gohil rulers of Bhavnagar. The Bungalow, built in a European colonial style with cottages and mansions surrounding the courtyard, faces the sea and offers beautiful view of the gulf. It attracts marine life enthusiasts for the variety of the kind found in the rocky shoals on the coast. It is also renowned for the temple of Gopnath Mahadev, where Narsingh Mehta is believed to have performed penance. One of the oldest monuments in Bhavnagar, it is a favourite spot for men of all age group. Old age people prefer to sit here and read newspaper, dailies, magazines to spend their time. Old books, manuscripts, rare coins, arms and armor used by the rulers of Bhavnagar are on display at the Barton Library and Museum.